You don't have to look far on the prairies to find a pile of weathered stones, overtaken by colonies of lichen. Wherever there are grainfields, farmers have regularly combed the surface to remove anything that might damage machinery. We were probably the only family ever who regularly raided these stone piles. While every other farmer quarantined the geological pests in sloughs or between adjacent fields, we hauled our field stones back to the home quarter and lined the banks of the dugout to protect against erosion. Years later, when dad carved the nearby slough deeper to build his own little lake, he reinforced the steep east bank with stones as well, and built a little island in the centre fully encircled by stones, choosing and hand-placing each rock with the care of an artist. To fuel the project, we scavenged rocks from a variety of stonepiles inherited from earlier custodians of our fields, some of them so large that they could only be lifted with the front-end loader. Aside from these artistic ventures, we went rock-picking in the fields as a necessary fieldwork task. In the sunny post-harvest days of autumn, I sat in the passenger seat of the little brown truck with dad at the steering wheel, our windows rolled down and our eyes peeled for both stones and wildlife. It was as much an exploratory safari as a stone-picking trip. In some of my memories, we used the tractor and front-end loader on these trips. I'd sit in the bucket with my legs dangling, hopping off whenever the tractor slowed and looking for the conspicuous stone that had prompted the stop. If it looked too heavy, dad would hop out of the cab and I would sprint around the area for anything pickworthy before we moved on. I'd sit in the bucket along with the stones until it became too full, then perch on the hitch in back or climb into the cab. My eldest brother would ramble around the fields in his ancient Datsun—more a hull than a vehicle—and load the back with stones. He'd visit all the spots that he had marked earlier with his GPS, a whole memory-full, all the sites he had noted while doing fieldwork. The driver-side door did not close—did not even have a latch—and was held shut with a tarp strap hooked one end in the door, one end between the front seats. The back door still latched, though, and at the end of his foray he would park at a steep tilt on the edge of the dugout, opening the door for gravity to tumble the stones out of the car. My earliest collection consisted of stones. Dad would bring home interesting ones he had found, teaching me about basalt and mica, orthoclase and quartz, limestone full of fossils. He had a collection of hammerheads out in the barn, and flinty arrowheads on the livingroom chiffonier, relics of another age. On vacations, I scoured beaches for tide-smoothed stones in shades of green that we didn't have back home. We'd visit rock shops and come home with souvenirs: cavernous crystalline geodes, overgrown cubes of hematite, petrified wood, brilliant polished cross-section slices, animal figures carved from jade. A large ponderous globe, its water of lapis lazuli and the countries in a variety of gemstones. The playhouse was luxurious, as far as playhouses go. It was insulated, wired for electricity, contained an antique stove that young me half-suspected was hooked up and functional (it wasn't), a rack of old Owl magazines, a few pieces of castoff furniture. The thick wooden door had a small hook on the inside to keep the building shut against inclement weather while in use, and the outside latch couldn't be accessed from inside. For many years, one of the panes in the kitchen window was missing, leaving an opening the size of a sheet of paper. Close to the backside of the building was a high wooden corral fence. If you climbed the fence, careful to avoid splinters, you could step onto one of the posts, tall and broad, and leap onto the playhouse roof. Up on the shingles under the full sun, I set trays of mud to dry into cakes, which I then stored in the little kitchen inside. Who knows why. Sometimes cats would hide their clutches of kittens inside and pass through the missing window at will. Or, the kittens would grow up in the space beneath the building between the skids, gamboling in the warm grass in front of the door and retreating underneath at anyone's approach. Over time, the wooden walls weathered, and one of the slats fell off entirely after I picked out the underlining with some irrational faith that it would grow back. A hive of bees took over the hollow wall using the opening I had so obligingly created, and for many years using the playhouse in the summer meant edging cautiously through the door trying to leave the bees unprovoked. The little building has now been tinned over and its interior painted, little resembling the image in my memories. One summer day, many of my relatives were visiting the farm for some celebration or other. Several of my siblings and I, and perhaps a couple cousins, were gathered in the playhouse at some point. One of the cousins—the same age as my sister and about five years older than me—got upset about something; I didn't know what at the time, and still don't. To our horror, he closed the heavy door and locked us inside, walking off in a huff. No matter how long you might elect to stay in a confined space, the very instant you're robbed of choice the situation becomes immediately unbearable. Suddenly you're suffocating, your muscles are cramping, the very air is oppressive and you notice you're dehydrated to the brink of death. The obvious tactic was to shout for help, but nobody was in earshot (except our jailor, rapidly dwindling into the distance). Being the youngest and smallest of the bunch, I was tasked with escaping through the only available route. I'm not sure how old I was at the time, but I was young enough to squirm through the empty windowpane on that occasion. Using my beanpole physique to great advantage, I slithered headfirst through the paper-sized opening, squeezing my shoulders through and stretching my hands toward the ground to break my fall, my siblings helping to maneuver me from inside. Kicking my feet free at last, I ran to unbolt the door. I remember little from that incident; but the images of the closed door, the uncertainty of my siblings, the back of our cousin as he walked away, and the scrape of the window's pastel-blue edge as I wrenched myself through—these are perfect images in my inner photo album. People occasionally ask me what my tattoo says. If they ask me what it means, I say "it's a long story." And it is. There's a lot of meaning behind it, much of it highly personal, and almost without exception people don't want an actual story. If I'm feeling ungenerous, I'll probably say something like "don't worry about it" or "it's in Latin" or "it says ask me about my tattoo." 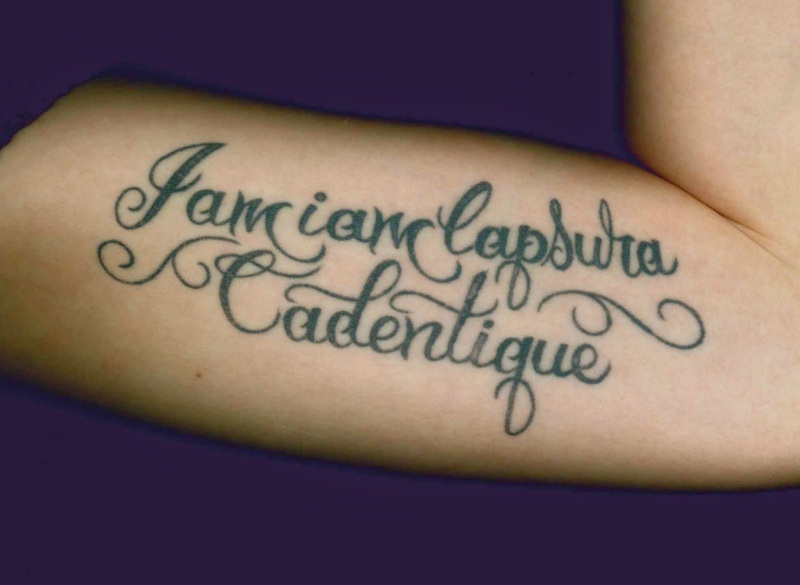 If I'm feeling literal: "It says iam iam lapsura cadentique." The meaning is both more complicated than I can easily relate, and more personal than the average person deserves to know. What better day to tell the story behind these words than Whan That Aprille Day? Back in undergrad when the world was bright and coursework fascinated me, I eagerly devoured all the Latin classes available at my university. There were four classes listed in the academic calendar, and over two years I progressed through all of them as the class sizes shriveled from 40 in the first class down to just me in the final class. For that solo directed reading, I worked through translating Book VI of Virgil's Aeneid, meeting weekly with my inspiring professor to read the translations I had prepared, do a little on the fly, and linger over the language. Book VI recounts Aeneas' trip to the underworld, where he glimpses all kinds of eternal punishments. It's there that Sisyphus pushes his boulder up a hill, only to watch it roll down and have to start all over. It's there that Tityos is splayed open over nine acres while a vulture picks at his liver, which regenerates overnight for the next day's torment. And it's there that the Lapith kings Ixion and Pirithous cower beneath an overhanging boulder that has just begun to slip and fall—forever. I might not have given a second though to the passage, had my professor not stopped and lingered over the semantic beauty of the double iam, imprinting the phrase in my memory. What doesn't quite translate is that the rock is not merely teetering, which would imply that there's a chance it won't fall. Rather, it describes that slow-motiony moment just beyond teetering, when disaster is certain, when equilibrium is irrevocably destabilized, when all you can do is watch helplessly as the thing happens before your very eyes. By its very nature, this kind of moment is fleeting in reality. But here, in the Underworld, the horrible doom of that moment renews itself every second of eternity. The second key element is perhaps the most obvious one: my internet handle, Lapsura, is derived from the phrase. On its own, lapsura is the nominative feminine singular form of the future active participle of labor ("to slip"). Just as they occasionally are in English, participles in Latin can be standalone nouns. All this is to say that lapsura means "she who is about to slip." It seemed the perfect alias for a Latin enthusiast whose inner self consisted only of self-doubt and a phobic obsession with time. The thing about internet handles is that it's hard to be unique. Almost anything you might want to call yourself has probably already been taken, somewhere, by someone. But as far as I can tell, Lapsura is still all mine. When a name is all your own, you can attach more character to it, and eventually it begins to accumulate its own. Finally, there are the circumstances around the day I got the tattoo itself. I had been toying with the idea of a tattoo for years, but couldn't think of anything. Then suddenly one melancholy autumn, I determined to do something spontaneous and planned a trip to Las Vegas to meet up with some people I had only ever interacted with online. It was the sort of adventurous thing that I had never done before. Although I was all set—I had plane tickets, vacation booked, and had started packing—I ultimately did not go, which I was certain at the time would be one of the biggest regrets of my life (and would have been, had the opportunity never arisen again). So there I was, lying in my cold apartment staring at the ceiling for a week, angry at myself and completely dejected, sunk into a deeper depression than the one I had been trying to shake. Midweek, I randomly got off the bus at a beach, where I sat and watched the bleak waves that seemed to match my mood so well. I sat there thinking that I may have missed my only chance to meet somebody who had changed my life. I wondered if this malingering black ship would ever sail out of the harbour, if I would ever find joy in life again. Sitting there, I decided quite suddenly to salvage what I could from the failed vacation and go get a tattoo. I knew exactly where I wanted it to go and, without it ever occurring to me before that moment, I knew the perfect phrase: iam iam lapsura cadentique. It was already full of meaning to me, and it also described that moment perfectly: I was in a fragile state, and I could see myself standing on the edge of a maelstrom about to be sucked under. I still do, sometimes. I took the bus straight downtown, strolled into the tattoo parlour—itself a bold act back in my days of severe anxiety—and made an appointment. Two days later, the phrase had become mine in the most tangible sense yet. So there you have it. There are a lot of things I could say when people ask me what it means. It transports me back to the more carefree days of my undergraduate degree. It evokes the gentle voice of my Latin professor and the enthusiasm she inspired in me for the language. It's my Vegas tattoo—marking the absence of Vegas rather than its presence. It's a reminder of hard times. It's an untranslatable moment of pure linguistic beauty. It's an accumulation of years in digital space. It's years of excessive emotions etched into my skin. It's a reminder of the debilitating numbness of depression. It's an anchor, that pulls me both to that fragile time and away from the brink it represents. It's inextricably bound up to the soundtrack of that phase of my life. It's a photographic image of cold Pacific waves. It's a symbol of my own defiant triumph. But if you were to stop me on the sidewalk and say "What does your tattoo say?" I couldn't do justice to its myriad meanings. And so I would simply say: "It's a long story." Two downy hawk chicks glared out of the car trunk, exuding sharpness from their talons, beaks and eyes. "Their mother disappeared a few days ago," dad explained. When you spend days in a field, you get to know its inhabitants as well as their conspicuous absences. You see miraculous life and the glory of animals in their habitat, but you also see the natural predation and the machinery accidents that leave nests flattened and small animals mangled. My dad has eyes like a hawk for the smallest sign of wild creatures. He would spot the mock-injured limp of a mother kilkdeer acting as decoy, and search for the nest she was trying to lure the tractor away from so that he could leave it intact. He would set a large stone beside any nest he found, to mark the avoidance spot for subsequent farming processes. He would spot a hiding fawn before the swather was upon it, and move it out of the way before he continued harvesting; it would have crept back into the standing crop by the time he had made a round, and he would move it again and again. He was always alert, always respectful of wildlife, and always loved the glimpses he caught of owls, elk, foxes, and moose. Knowing that the abandoned hawk chicks would die sooner rather than later on their own, he brought them home. They went into in an large chickenwire cage that had housed an orphan owl over a decade earlier. I was always eager to understand animals and forge a quiet bond with them, so I was happy to inherit the task of keeping the chicks fed and watered. For the first while, I fed them eggs that may or may not have been incubated for a while. A couple of our hens were enthusiastic about hatching a brood that summer, and as a result we occasionally had partially-developed eggs that made their way into the other nestboxes; the safest solution at the time was to open every egg, freeze the good ones, and discard the bad ones. And so, I filled a syringe with the scrambled mixture of yolk, blood, and rough outlines of eyeballs, held each chick pinning their talons so they couldn't shred me, and maneuvered the syringe into their beaks where i could discharge the contents right down their throats. Their deadly talons clenched my heavy leather workgloves, and they snapped their beaks fiercely at the syringe. After a couple weeks I moved on to ground beef, still maintaining the procedure with the syringe. One time I hesitated as I held the syringe in front of them, and realized that they were no longer fighting it; rather, their snaps were more purposeful and they were scrabbling to grab the meat. After that, they received their meals in a bowl. For a while the two looked identical, but as time went on one of the chicks became runty and underdeveloped. It was still downy when it finally died. The other chick, though, grew strong and fiery, and in time was a rich deep brown with a lighter brown front. Its talons became even more deadly-looking, jet black like the toothbrush-moustache tip of its hooked beak. 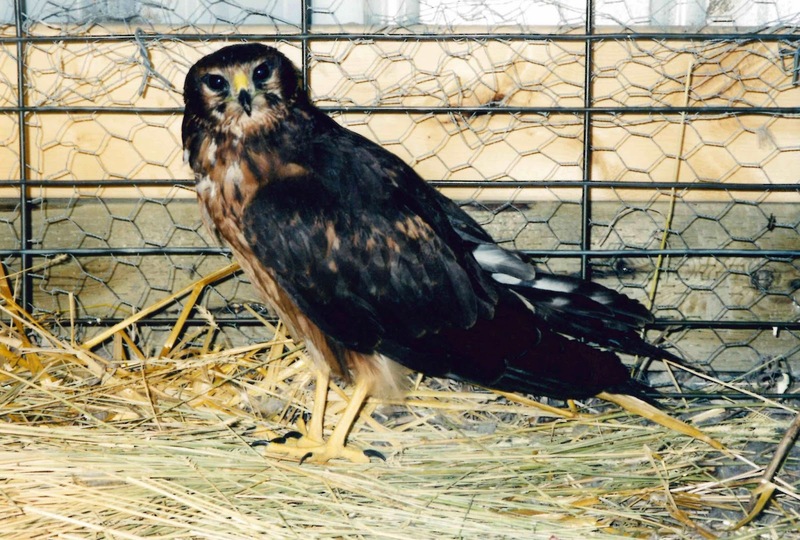 I would sit by the cage for hours on the cool earth floor of the shed, watching the hawk and quietly talking to it. One day I confiscated a mouse that I found a cat playing with, and dropped it into the hawk's food bowl. It snapped the mouse up a microsecond after it had touched the dish and swallowed it whole, coughing out a pellet of bones and fur a few hours later. As the summer wore on, we used a front-end loader to perch the cage outdoors and I had to climb a ladder to feed the hawk. Then, as summer faded to autumn, we brought back inside, opened the door of the cage, and gave the hawk free run of the shed for a few days. Finally, we opened the main door an armspan and stepped back as the hawk waited for half a moment, took wing, and flew out and away into the trees. I hoped it would cope well on its own. It was at least a week later that I caught sight of something tumble out from the scrubby willows by the water and take a few tentative steps onto the path that wound around to our yard. Back?? I was shocked that this wild bird that had never shown any domestic tendencies had returned so close to the house. But it must have been hungry; I hurriedly thawed some ground beef and approached it as unmenacingly as I could. The hawk's steely eyes watched me set the dish down, and it quickly consumed the contents before giving me one last sharp look and tottering back into the foliage. That was the last time I fed my unlikely friend, although I did keep an eye out for its return. A few days later as I roamed in the trees, I stumbled upon a heap of deep and light brown feathers, ranging from soft down to broad flight feathers. It wasn't far from where I had buried my tiger finch the previous winter. Sadly, I picked out one perfect beautiful feather, and took it back to the house where I placed it in a vase on my desk. "I always wanted a pair of finches," my dad told me on the long drive home from the pet store in the city. Two tiny tiger finches were in a little cardboard box; they were going to be my "Small Pets" 4-H project for the year. A drab light-brown female, and a dusky gray male with burnished copper cheeks, white breast, and a strip of copper speckles dividing his white front from gray back. Both finches had pumpkin-orange beaks and feet. Neither of them ever had names. They were tiny bundles of energy, hopping ceaselessly back and forth from one perch to the other. They only stopped their nasal finch-beep calls when they were dozing, and the male would lustily sing his shrill melody as often as he could. Their cage sat on top of the record player, just to the left of the TV. Whenever they heard a tiger roar on the TV, they would both raise their voices in alarm, warning everyone who cared to listen of the nearby danger. In the evening they would lean against each other, grooming themselves and taking turns preening each other's faces. At night they roosted snuggled side by side, their tiny beaks silent and tucked behind their wings. I covered their cage with a lightweight cotton baby blanket adorned with images of zoo animals. They would stay quiet until the blanket was removed in the morning, and daylight refilled them with energy and song. One evening in their first year, the male escaped the cage and flapped terrified around the house, descending the staircase and losing his way completely until he came to a frightened perch in the pitch dark family room. I found him tucked in a bookshelf, his little talons clinging to the books. The first thing that became apparent was that he was all but blind in the dark, which made him easy enough to catch. His tiny body felt massless in my fist, and his little heart thumped furiously against my fingers until I deposited him back into the cage. They began in a smallish cage, but soon inherited a two-storey rig cobbled together from smaller cages, with multiple entries and nooks. In one of the doors I attached an enclosed addon bath that they used to enthusiastically splash the entire vicinity, until I filled it with shredded kleenex for them to use as a nest instead. They tried diligently to raise a nest of eggs, but the chicks would inevitably die days after hatching and be unceremoniously pushed onto the cage floor. The female was always sickly, and died at age two. She sat on the floor of the cage for the final day or two; one morning I found her lying on her back with her little orange feet gently curled toward the sky, while her partner sat quietly on the highest perch possible. One day I forgot to close the cage door after refilling his food dish, and noticed with some alarm that he was perched on the open door looking out at the room for a long time. Eventually he turned and hopped back inside, and I quickly latched the door behind him. But before long we began to keep the door open for him to come and go as he pleased. Most of the time he sat in the plant stand in front of the large living room window, peering out at the trees and wildlife and picking at the houseplant leaves. Once in a while he would stretch his wings and fly a lap around the wall segment dividing the living room from the kitchen/dining room before returning to his perch and singing at the world outside the window. When he was hungry, thirsty, or night was falling, he would return to his cage. After he had settled into his nest for the night, I would close the door and cover the cage with his animal print blanket. He had learned from his first frightening brush with freedom, and kept to the open upstairs rooms in his vicinity, scrutinizing his surroundings before embarking on any flight path. The summer he was four was the summer my parents' new house was being completed across the yard. My eldest brother and his young family had moved in with us in the house my siblings and I were raised in. I was finishing up grade 11, and would move with my parents to the new house for my final year of high school while my brother's family assumed the old house. My brother would farm in partnership with my dad, while my sister-in-law—who had previously run a daycare—began to provide childcare on the farm for a handful of children. On fine days we hung the finch cage on the deck near the goldfinch feeder, so he could feel the breeze and talk to his wild comrades. Given his free reign of the house, it was probably inevitable that one time he would find himself out on the deck with his cage door inadvertently open. I came home from school one day to learn that dad had put the finch's cage outside to distance him from the exuberant children that were there that day, not realizing that the cage door was open. A tiny exotic bird did not stand a chance in the enormous expanse of lawns, gardens, orchard, shelterbelts, dugout, and buildings that formed our yard. Any number of bird or mammalian predators would find him; he would become hopelessly lost in the enormity of the outside world; he would freeze overnight or in the cold prairie rain. Most of all he would be frightened and alone, and in any case he would never be back. Nevertheless, I traipsed helplessly around the yard as far as the orchard, carrying the cage on the slimmest of hopes that maybe he had had enough exploring and was ready for some familiarity. After my fruitless search, I hung the cage back on the deck and ignored my family's assurances that they'd buy me a replacement bird. I don't want a replacement. I want my little buddy. In the morning, I walked into the dining room and sighed as I looked out at the forlorn cage on the deck. Then I blinked. My finch was inside, gustily pecking at his food dish. I slid out into the deck and closed the cage door in disbelief, then brought him inside to his spot on the record player by the TV. The little finch made the move across the yard with us to the new house once it was ready for habitation. But he was five years old now—the lower end of his species' life expectancy—and gray feathers pocked his copper cheeks. Over the year he increasingly slowed down, until one winter morning his little feet reached up to the sky like his partner's had years before. His body was even lighter in my hand than I remembered, as I carried him out to a bank overlooking the tiny lake and island my dad had painstakingly built. I dug through the snow and into the cold ground beneath, and placed my little wrapped bundle in a shallow hole beneath a willow. I covered it back up and placed a stone on top. Goodbye, little friend. Autumn has always been my favourite season because of its association with my idyllic memories of harvest. When I think of my favourite autumn colours, they are in terms of farming and rural life: the burnt orange of pea stubble; the sunny gold of aspens; the scattering of yellow and red leaves over green grass; the rich variety of pale and deep brown grains; the dusty red of the Big Grain Truck—puny by today's semi standards; the bare grey-brown of dirt trails packed hard by heavy machinery; the clear blue of the autumn sky, the flame of prairie sunset. There are of course the less palatable harvest memories, too: clouds of fat grasshoppers whirring into your hair and down your shirt collar; the burning fumes of caraway seed; dust choking the air inside the combine cab. Even these have a certain nostalgia attached to them. When I was very young and there was still a bustling hub of a grain elevator in my hometown, I would sometimes get to tag along when dad hauled a load to town. Sometimes my brother was also in the truck cab, and one of us would sit on an upturned 5-gallon pail between the two seats. My earliest memory is from before I began school, probably when I was taken along out of necessity on days when my mom was away at a 12-hour shift. I'm watching as wheat pours liquidly out of the truck's raised box and pools onto a grate in the floor. An elevator employee and my dad work with grain shovels to encourage the grain out of the truck and through the grate. Everything has that golden tint of prairie autumn sunshine, and shafts of light ignite the airborne grain dust. My next earliest memories of harvest were riding along on the self-propelled swather, as my dad cut hay near the yard or long rounds around golden fields. I sat on the sunny engine-warmed flat space in back of the seat, wearing heavy-duty earmuffs, feeling more than hearing the contented whirr of the blades as they cut through the crop while the reel gently batted the cut sheaves onto the conveyor belt, spinning a golden swath that trailed behind us. I would watch my father as he prepared and maintained the machinery each day, going over it with a grease gun, repairing conveyor belts, blowing chaff from the radiators with the air compressor. If I was lucky he would save the delicate pith ball for me. If I was luckier, I'd be able to help out in some small way. Later, I would ride in the tractor cab as the combine gobbled up the cured swaths and the hopper filled with a bounty of grain. Sitting on the narrow window ledge in the tractor cab, my dad would sing in his clear tenor, and I would join in. Years later when I was in university and driving the swather or combine on my own, I sang those same songs that he had taught me. When I was very young, it was much less common to see an airplane flying overhead than it became in my teenage years. In the quiet of my parents' farm, you could hear the jet engines even though they were impossibly far away, and you could follow the gentle white contrails all the way across the wide prairie sky. On a lazy summer day with a clear blue sky, it could almost be peaceful. Unless your older brother told you they were bomber planes. I remember us running with our heads hunched down and our hearts thumping, hoping to reach the safety of the shop before we were spotted and the bombs let loose. Maybe it was a crop duster, which would understandably be more alarming than a high-flying jet. It was the late 1980s; who knows what bits of media had rearranged themselves in my brother's young mind to manufacture the idea. In any case, the sound of a jet engine would thereafter grip me with the terrified need to hide, and I would run for the nearest roof—the house, a barn, a shed, even tucked under the hopper of a granary. Years later, when the first helicopter that I encountered "in the wild" hovered overhead dropping off bundles of oil-surveying equipment, I watched from a hidden vantage point and only scurried away when the helicopter was facing away from me. At some point, somebody must have set me straight about airplanes, though I can't remember when or who. The impulse to hide from outsiders, though, had been instilled deep, and went far beyond aircraft. At any sign of an approaching vehicle—which were not frequent, as our kilometer-long lane was a dead end that only visitors, the schoolbus, and disoriented travelers would drive down—we children would tuck ourselves into one of myriad hiding spots and stay out of sight until the coast was clear. I'm not sure what the motivation was; it seemed to be a mixture of uncertainty, unwillingness to be involved in conversation, a sense of safety that came from seclusion, and the reinforcement that comes with years of habit. I learned to be as invisible as possible, to see without being seen, to listen without sharing my own inner dialogue.